Effective estate planning ensures that your property and/or possessions go to the people you choose when you die. It can also be financially beneficial to the recipients of your estate as it can reduce the amount of tax paid to HMRC on your estate. An individual’s estate is defined as the things that belong to them or that they own a share in. This can include property, investments, pension payments, insurance, cars, jewellery and furniture. If you own any assets or property jointly then your share of the asset will be included in your estate. If you have given any of your property away or you have benefitted from a gift during the previous 7 years, these assets will also be considered as a part of your estate. it can avoid potentially lengthy, expensive and emotional disputes over your estate. If you do not make a will, which is legally defined as dying intestate, then your estate may not go to the people you intended. Although intestacy rules differ between England and Wales, and Scotland the principles are similar. In general spouses and civil partners have the greatest access to estates, followed by children and parents and siblings. If you are in a relationship but not married or in a civil partnership, your partner has no automatic right to your estate. Making a will might sound daunting but it is usually more straightforward than expected. There are a number of options you can choose from when drafting a will. Using a solicitor to draft your will is the most sensible option. They will be experienced and the will should be watertight (solicitors can also store the will for you, sometimes at an additional charge). Some banks also offer a will writing service and advice about estate planning although it is advisable to check what the cost will be as sometimes they can be expensive. You can purchase DIY wills which have a set template wich you fill in. You can use a professional will writing service or will writer although it is advisable to confirm that they are members of the Institute of Professional Will Writers. Charities sometimes offer a free will writing service in the hope that you will leave them some money in the will although there is no obligation to do so. Talk to us about preparing your will. This valuation will help you work out whether your beneficiaries will have to pay inheritance tax (IHT). The valuation will also help you to ensure that your estate is divided equitably between your beneficiaries. IHT is tax levied on a person’s estate when they die. 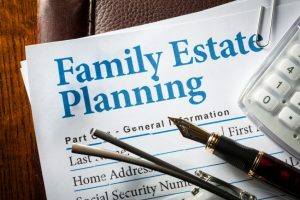 IHT planning is an essential element of estate planning. If done correctly it can reduce the amount of IHT paid on an estate. The current IHT threshold is £325,000. If your estate is worth less than the threshold it will not be subject to IHT. The current IHT rate of 40% is levied on anything above the threshold. A reduced rate of 36% is applicable if a person leaves more than 10% of their estate to charity. It’s possible to transfer any unused nil-rate band to a spouse or civil partner. From 6 April 2017, an additional nil-rate band of £100,000 will be introduced when a main residence is passed on death to direct descendants. The ‘main residence nil-rate band’ will increase by £25,000 each year until it reaches £175,000 in 2020, after which it will increase in line with the consumer prices index. This nil-rate band is also transferrable to a spouse or civil partner. We can advise on IHT planning. Trusts can be used to minimise IHT. A bare trust allows assets to be held in the name of a trustee but go to a separate beneficiary. The beneficiary has the rights to the assets and income from the trust. Asset transfers into a bare trust may be exempt from IHT as long as the person transferring the assets lives for 7 years after making the transfer. An interest in possession trust is where the beneficiary is entitled to trust income as it is produced. There is no IHT due on assets transferred into this trust before 22 March 2006, however a 10-yearly IHT charge may be due on assets transferred on or after 22 March 2006. IHT is not due on assets during the lifetime of the trust while they remain in the trust and in the interest of the beneficiary. Will trusts are when someone requests that their assets be placed in trust in their will. Whoever is deemed the personal representative of the deceased must establish the trust and ensure that it is administered correctly. There is no IHT due on trusts for bereaved minors if the assets are set aside only for them and they are fully entitled to the assets by the time they are 18. A trust may also be set up for anyone aged between 18 and 25 and the tenth anniversary inheritance tax is not levied. The beneficiary must be fully entitled to the assets in the trust when they reach 25 and exit taxes may apply when the beneficiary is between 18 and 25. There is no 10-yearly or exit charge levied on trusts for disabled beneficiaries while the assets remain in the trust and remain the interest of the beneficiary. Asset transfers into a trust for disabled beneficiaries are also exempt from IHT as long as the person transferring the assets lives for 7 years after making the transfer. It is always advisable to seek expert advice when establishing a trust. Gifting assets or money can also reduce IHT. However, some gifts made when you are alive may still be liable for IHT. If you die within 7 years of making a gift, it will be liable for IHT though the rate is reduced for gifts made between 3 and 7 years of death. Gifts to your spouse or civil partner are not liable for IHT as they are not counted as part of your estate. When they die they will be included in their estate. gifts to dependents requiring your support. Talk to us about estate planning today.